We are selling s/v Ta Hi, our Mariner 36 Masthead Sloop as we have accomplished what we set out to do. For the past the 7 years my wife and I have comfortably sailed her by ourselves 5 months of the year, exploring the Baltic Sea, Gulf of Bothnia, North Sea and the North Atlantic. She has indoor winter storage at Skillinge Shipsyard AB (www.skillingevarv.se) in southern Sweden, with easy access to Copenhagen Airport. The Yacht is well located to explore the northern European waters, countries and the great variety of cultures, not to forget the great archipelagos of Sweden, Aaland, Finland, Norway and Estonia. Bornholm and Christians Oe (in 4 – 5 hrs) Poland and Germany (15 – 18 hrs) or a first experience of the Swedish archipelago in Blekinge (12 – 15 hrs). The Yacht is well fitted out for cruising and ready to sail: new sails (2011), oversized standing rigging, latest electronics including DSC VHF, AIS Class B and Epirb, all with independent antennas and GPS. The engine is a Yanmar 3QM30, 33 hp pushing the yacht at 6 knots cruising speed. Interested parties will be able to view her on the hard during the second half of April 2017 and from first of May 2017 in the water. We will sail her from mid-May 2017 until mid-September 2017 or until she is sold. 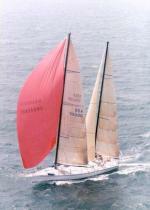 For further information related to the sale of s/v Ta Hi: www.sytahi.wordpress.com.